One reason I find knitting so much easier to fit into my life than other crafts, is that it is highly mobile. I spend much of my typical day on the go, so being able to grab whatever it is I have on the needles and leave the house with all the tools I might need, is crucial. Not being especially well-organised by nature, it took me a while to develop a good system for that. But when I finally did, it improved my productivity so much, that I thought it might be fun to share my setup. Plus, who doesn't like the 'What's in Your Bag' game? As I now do regular design work for several yarn companies, I typically have quite a few projects going at the same time. Having all my notions in one place allows me to access them quickly, without having to fish for everything piece-by-piece every time I switch what I am working on. I carry notions in a pouch that closes securely and is small enough to fit into any handbag, project bag, or coat pocket. I use two types of tapestry needles: a blunt one for moving stitches onto scrap yarn and doing sewn bind-offs, and a sharp one for weaving in ends. Keeping the needles in a plexi capsule prevents them from straying away and poking me. A small ball of cotton scrap yarn is essential, as I am constantly putting sleeve stitches on hold and doing provisional cast-ons. On the go, I tend to use simple, washer-style stitch markers, as the more elaborate ones have a tendency to get caught on things. I keep the markers safe in a tiny tin that closes securely. In the interest of saving space and weight, I prefer small, cloth covered tape measurers. Choosing a florid design tends to discourage my husband from borrowing them. I do not often need to use a needle gauge on the go. But having a tiny one, just in case, proves useful from time to time and doesn't take up much space. Finally, my keychain-sized Swiss army knife contains two tools I use all the time: scissors for snipping yarn, and a nail file for smoothing hang nails. Granted, these aren't brilliant versions of said tools. But while I did start off carrying proper embroidery scissors and a real nail file, they would always snag on things and scratch me - so, all in all, I find the folding knife version more convenient. 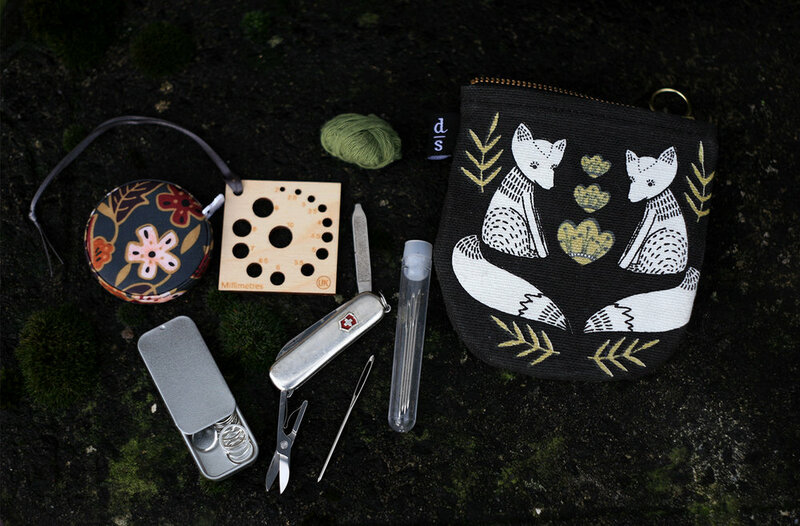 As mentioned already, each of these items is miniature sized, as is the pouch. The whole kit can pretty much fit into the palm of my hand - making it, quite literally, handy. Whether your notions kit looks anything like mine, or not, I hope you too have found something that keeps you organised and helps you knit whenever, where-ever, you feel like!